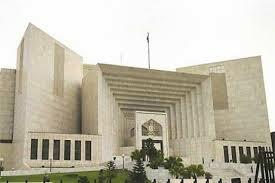 ISLAMABAD: The Supreme Court (SC) on Tuesday issued an interlocutory injunction against the implementation of a verdict given by a military court which convicted 14 individuals awarded them with life imprisonment. A three-member bench led by Justice Sheikh Azmat Saeed, heard the appeal filed by the convicts against the judgement. Notices were issued to the federation, the Interior Ministry, the Defence Ministry, the Army Chief, the Corps Commander (10 corps) and others as respondents. The case was heard by the SC after the Lahore High Court (LHC) Rawalpindi Bench had refused to hear the case pertaining to its lack of jurisdiction. The convicts had been sentenced to life imprisonment by a military court after being found in the killing of two Rangers personnel in Gilgit in 2005. Earlier, military courts were abolished on January 7, 2017, after the sunset clause had expired which sanctioned the military tribunals. Later, on March 31, 2017, President Mamnoon Hussain gave his formal assent to the both Pakistan Army Act 2017 and the 23rd Constitutional Amendment Bill that extended the powers vested to the military tribunals for another two years.